These shoes are made from leather and are nice and soft, they are lace ups for warmth and a good fit. This has been a popular shoe in the past and Hotter shoes have now re-shaped the soles for easier walking and comfort. There is a silk insole for warmth and comfort and they are perfect for walking in or standing on your feet for long periods. This is a good shoe for winter as they are very warm and can be worn with trouser or skirts. These shoes have a pretty panel in the front, they come in four colours to choose from, are made from leather and are slip ons for comfort and easy use. They look great with jeans or a skirt and are perfect to go out in the evening. These shoes have a self seal fastener that goes over the top of the foot for easy comfort and good fit. They have a silk insole for comfort and warmth and a light weight flat sole for easy movement. Nice and warm for the winter months and a popular shoe for the cold months. These are lace up shoes that are very warm for winter, made of leather, cushioned inside and grip on the soles. Perfect to where in the winter months and perfect for walking in or standing for a long time. A nice addition to your cold weather wardrobe. These lovely fun shoes have suede uppers, leather linings and slip resistant soles. They are great for casual wear and are really something very different that you can only get from Boden. They would look great with jeans or a casual skirt and would really make a statement for your wardrobe. 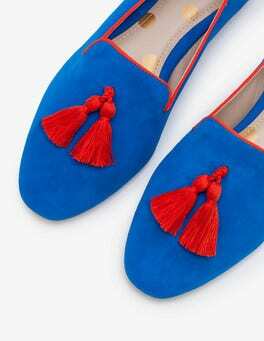 These are beautiful suede shoes that are ideal for the Spring. They come in three colours and a variety of sizes. They are a novel shape that will get you noticed and look nice with skirts and trousers. Perfect for the evening and look smart for day time functions. They have a padded insole that will give you comfort when on your feet all day. This is a good buy from Boden and you won't get them anywhere else. Hotter Shoes have some great shoes, waterproof GORE-TEX shoes. Great for the outdoors or just for rainy days in spring and summer. Hotter shoes have a stylish and comfortable collection with special Gore-Tex product technology that make them the best. Clarks have a great new range of heels. These Mary Janes have a cushioned sock and leather uppers. They come in three colours beige, black and metallic. They have pretty detailing on the toes and a low heel. They are pretty, comfortable to walk in and easy to stand in all day. Looks great with daytime clothes, easy to slip on and you know you will look good in them. To buy or read more about Pediconfort Mary Janes just click the link below.